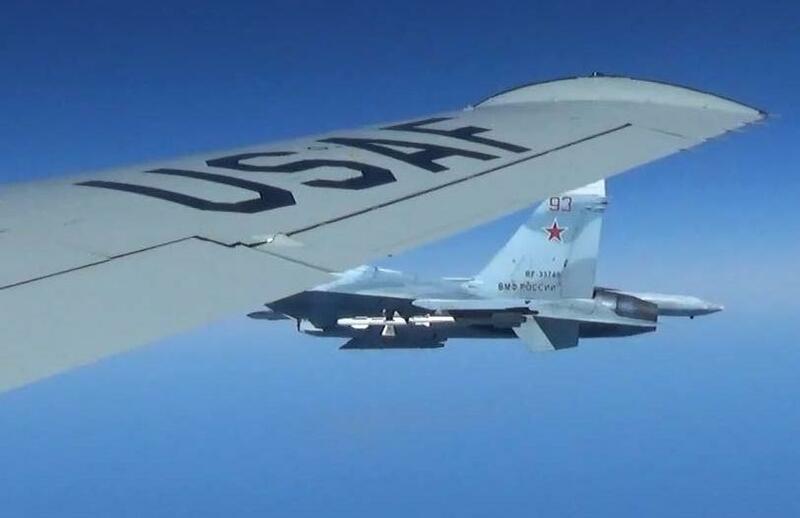 Military officials have released images showing a Russian jet that came within five feet of a U.S. reconnaissance plane over the Baltic Sea this week. CBS News national security correspondent David Martin reported about the incident Tuesday. The Russian aircraft came within five feet of a wing tip of a U.S. RC-135 reconnaissance plane, then flew under the U.S. aircraft and came up near the other wing tip, according to a U.S. official. Martin reported that the U.S. Air Force considered the incident to be an unsafe intercept. The Russian Defense Ministry claimed Tuesday that the RC-135 plane swerved dangerously near a Russian SU-27 fighter jet, according to the Reuters news agency which cited Russia's state-owned RIA Novosti news agency. U.S. Navy Capt. Jeff Davis, a Pentagon spokesman, said the American plane "did nothing to provoke this behavior," Reuters added. The RC-135 reconnaissance plane compares in size to a commercial aircraft and is used to collect all electronic transmissions from a particular area. The incident is reported to have happened 25 miles northwest of the Russian enclave of Kaliningrad.